Deborah's Journal: What's Going On in the Studio? I finally redid the sky. I like it much better. 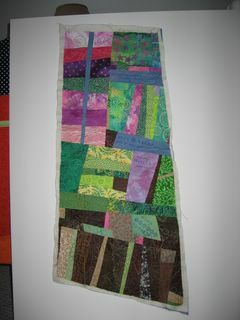 I haven't sewn it to the tryptic yet. Maybe later today. The white strip has text from Genesis 1 about the second day, when God created the sky. I'll post several close ups of the self portrait when it's all done. It's supposed to be done by Saturday to share at the Art Quilts Maine meeting. That's the group that issued the challenge in the first place. 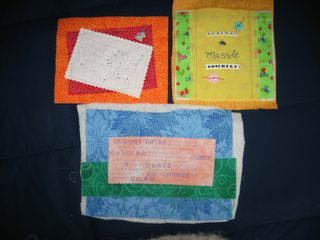 These are a few of the "collages" for the bottom border of the self protrait. The red and orange one is a map of the USA with beads in all of the places I've lived and a little house milagro that Kate gave me from her trip to NM. The green and yellow one is my NAME. I associate a lot of my identity with my name... so here it is. And the blue one, which will get more embellishment, is a baptismal prayer from the sacrament of baptism from The Book of Common Prayer. I need to make a couple of more collages to fill up the bottom border. Possible themes: chocolate, Tridelta, Disney World. 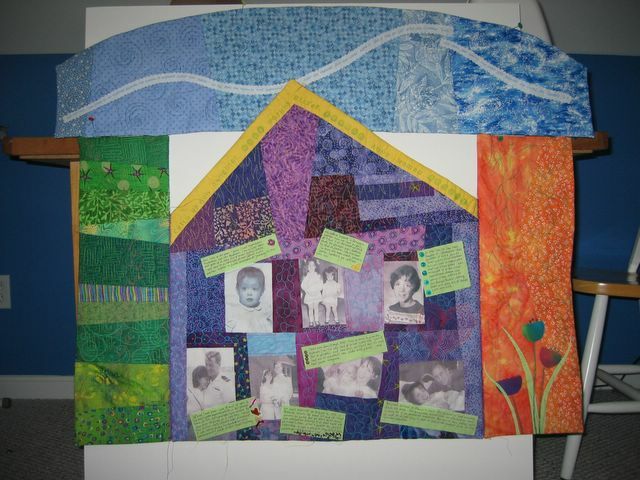 This is the project I worked on at the quiltathon (see post below). 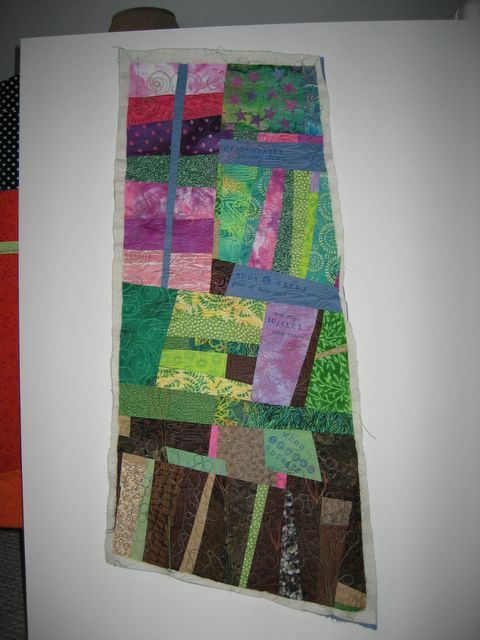 I did all the quilting on "Spring." I turned out pretty well. Maybe I'll post a close up. I am working on a seasons series in this same style and format. Winter is done except for a bit of embellishing and I've picked out fabrics for summer. Now to bind Spring and add a bit of embellishment. This sky is SOOOOOOOOOOOO much better, Deborah. It feels like sky and the design has a "wind" quality to it. I went back and looked at the other sky and it looked so heavy, not weightless as the new one does. What a difference. Also, I got to look at those terrific arches again. I couldn't post that day (blogger gremlins) and I was so irritated. They still hold up visually. I hope that you make some more. They are very symbolic and elegant looking. Deborah - I love the way your portrait is really coming to gether! I love the added detail of the places you have lived and the baptismal one. I can't wait to see it in "person"! Do I recognize some of my hand-dyed fabric? Your self portrait is really coming together very nicely. Like what you are doing and Sonji (who is always right, right?) is right about the sky! !